The moon, the only natural satellite of the planet of Earth, has been an object of wonder throughout history. A central figure in many early religious beliefs and ancient legends, a number of gods and goddesses have been associated with the pale orb. Thoth, for instance, who was usually represented as having the head and neck of an ibis, was the ancient Egyptian god of the moon, while Susanowo is the god associated with that body in the Shinto religion. Perhaps more widely familiar today, however, are the Greek and Roman mythologies in which females, such as Selene, Artemis, Diana, and Luna are associated with moon, the latter of which serves as the origin of many words related to the moon that are utilized in modern times, such as lunar and lunation. Indeed, terms such as lunatic and lunacy are derived from the name of the Roman goddess as well, their roots reflecting the long-held belief that the moon could affect behavior and cause periods of insanity. Further demonstrating this conviction are the many instances of folklore that relate stories of werewolves that gain their power from the moon and shape shift when it is full, turning from man to beast. Attempts to help lift the shroud of mystery surrounding the moon began early, several different civilizations of antiquity beginning primitive investigations. The earliest focus was apparently the movements of the body, both Chinese and Middle Eastern astrologists building up a large enough corpus of information that they could successfully predict eclipses. Observations of the moon by the Greek astronomer Hipparchus, on the other hand, enabled him to accurately describe the Earth's shape as spherical, account for the phases of the moon, and estimate the distance between the two worlds with surprising precision considering the tools available to him at the time. From such promising beginnings the knowledge base about the moon grew slowly but steadily over the ages, the period of the Renaissance being particularly fruitful due to the efforts of such inquisitive minds as Johannes Kepler, Tycho Brahe, and Galileo. Yet, it was not until a wave of scientific and technological advances took place in the twentieth century that a new kind of observation of the moon was made possible. The development of rocket theory, guided missiles, artificial satellites, and various spacecrafts all played an important role in the eventual accomplishment of landing man upon moon, enabling him for the first time to examine its surface while standing upon it. Following years of preliminary work, circumlunar explorations, and unmanned attempts to reach the moon by both the Soviet Union and the United States, on July 20, 1969 Neil Armstrong and Edwin "Buzz" Aldrin, Jr. landed in the Sea of Tranquility and trod the lunar surface for the first time, while Michael Collins remained in orbit with the command and service modules that would carry them home as heroes. Between that year and 1972 the National Aeronautics and Space Administration (NASA) successfully landed 12 astronauts on the moon who cumulatively collected 2,196 documented samples of lunar soils and rocks weighing a total of 382 kilograms (843 pounds) during approximately 80 hours of exploration. These samples were gathered from a harsh lunar environment that included wildly fluctuating temperatures in an almost complete vacuum and dangerous solar radiation, while the uncertainty of return to Earth due to equipment failure was also a concern for the brave astronauts of the Apollo missions. Through such hazards, however, they succeeded in providing a wealth of information to the scientific world regarding the moon that was unattainable by any other means that were previously available. Before actual human contact with the moon, geologists hoped that exploration of the lunar surface would establish its composition, internal structure, geological history, and evolution. In this respect it was thought that the moon would serve as a model for the early history of the Earth and the rest of the solar system. However, based on Apollo-missions research it has been determined that the moon is far more complex than previously thought and though much knowledge has been gained, such a comprehensive understanding of the body as was originally hoped for is still a long way off. Yet, it is widely accepted that the Earth's satellite was formed approximately 4.6 billion years ago along with the rest of the planets and that it has partially melted and differentiated during its history. Part of the information regarding this melting and differentiation has been obtained by studying samples from the two primary domains of the lunar surface, the dark lunar mares (Latin for "seas") or lowlands and the lunar highlands, which have a lighter appearance. The rocks found in the highland and lowland regions of the moon have been found to be commonly of different types. 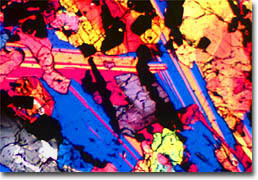 Those of lowland-origin that have been studied are typically basalts, similar to the one that appears in the photomicrograph illustrated in our banner. 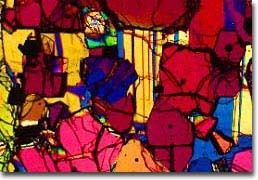 The polished thin section of moon rock was derived from a sample collected from the Oceanus Procellarum (Latin for "Ocean of Storms") mare region by Apollo 12 astronauts. 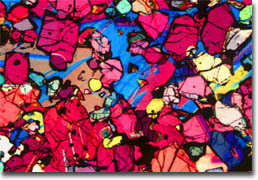 The most common rock samples obtained from the lunar highlands are anorthosites that are relatively rich in aluminum, calcium, and silicon. 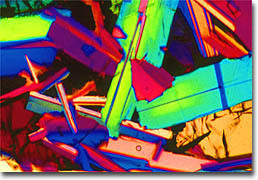 Anorthosites are granular igneous rocks comprised predominantly of feldspar. 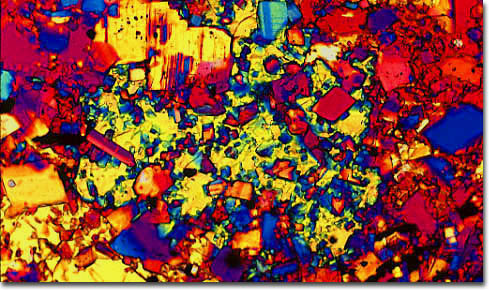 It is also important to note, however, that many lunar rocks are also breccias, which consist of angular or subangular fragments imbedded in a fine-grained matrix. These rocks are believed to have been created from the impact of meteorites on the lunar surface. The large number of impacts endured by the moon, which has little atmosphere to impede incoming objects, is also evidenced by the layer of loose rock fragments known as the regolith that occurs along much of its surface.